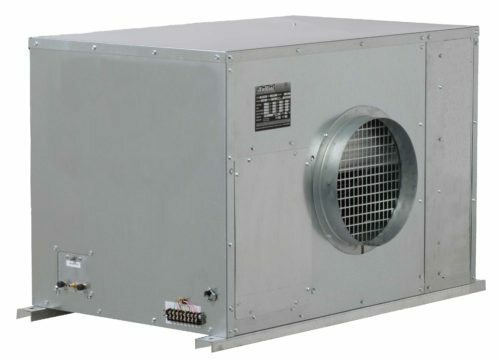 The Model KCW6021 (nominal 5-ton or 60,000 BTU) is the smallest water-cooled unit possible in size and capacity in The Ceiling Master Series, KwiKool’s Permanent Line of Above-Ceiling Mounted units. With its no frills features, high sensible cooling, and extremely small size, the KCW6021 is the perfect solution for cooling small server and IDF rooms, especially when floor space is limited. The Ceiling Master Series, KCW water-cooled models, perform and out last the competition with its small size, high efficiency, and lower cost. The built-in mounting supports on the unit’s base allow for easy installation by a qualified mechanical contractor above a drop ceiling, using standard, off-the-shelf hardware. All Ceiling Master Series KCW water-cooled above-ceiling mounted units require access to a circulating water system, such as a chilled water system. Using tap water for water-cooled models is not recommended. The KCW models are equipped with a self-regulating internal water regulating valve, which is rated up to 150 psi. KwiKool’s self-contained design also eliminates the need for refrigerant connections, further reducing installation costs. All Ceiling Master Series KCW units come with two mounted flanges, which allow duct connection for the cold air supply and return. The KCW6021 runs on a standard 230-volt/40-amp single phase circuit and uses any 20-volt thermostat. The unit also comes with an internal high lift condensate pump.